In this week’s reading from Parashat Vayetze (Shemot / Genesis 28:10-32:2) Jacob flees, on the advice of his mother, from his brother Esau. There is a lot that occurs in this week’s Torah portion, we read that while traveling, Jacob lays down and falls asleep and the Lord speaks to him in a dream (וַיַּחֲלֹם) about the covenant He made with his fathers (Bereshit / Genesis 28:10-19), and the Lord promises to be with him too. Jacob travels to Haran and meets Laban his mother’s brother (29:9-14) and marries Rachel and Leah and the entire nation of Israel is born, all except Benjamin the youngest son. On arriving in Haran, he falls in love and makes a deal with Laban to work seven years for Rachel to be his wife (29:18-21). Laban tricks Jacob and gives the older daughter Leah instead and so he works another seven years for Rachel (29:22-28). The twelve tribes of Israel are born to Leah, Rachel, Zilpah, and Bilhah, (29:31-30:27). Jacob and Laban agree on wages (30:28-43) for the work that Jacob is performing, and the Lord greatly prospers Jacob and his flocks. As a result, Laban and his sons are upset that Jacob has become so wealthy in cattle (31:1-3). The Lord speaks to Jacob that it is time for him to return to the land of Canaan, to take his family, and all he owns, back to the land of Canaan (31:4-21). The Torah portion concludes with Jacob making a covenant with Laban to do no harm to one another (31:22-32:2). In the opening verses of this week’s portion, the Lord speaks by a dream and Jacob has a vision of angels ascending and descending upon a ladder. We are told that the Lord God stood over top of the ladder, and then he stood next to the ladder and spoke to Jacob. This is the first time the Lord God has revealed Himself to Jacob according to the Torah. Previously, the Lord has been revealed through his father, and family speaking of the goodness of God and how he has worked in their lives. (Note the importance of our sharing our faith with family and friends.) As the Lord reveals Himself to Jacob, He reiterates the covenant that He made with his fathers Abraham and Isaac, and this affects Jacob in a powerful way. He renames the place, “Beit-El” (בֵּית-אֵל, Bethel, “House of God”) and recognizes the meaning of these words and so he faithfully promises to return a tenth of the wealth God will give him. Jacob rose early recognizing the significance of the dream. The Lord had revealed His presence in this place and made a promise. As a result, Jacob set up a metzevah (מַצֵּבָה, pillar) and anointed the pillar with oil. Jacob then makes a covenant with God using this pillar as a sign that if the Lord brings him back to this place, and provides for the necessities of life, he says “then the Lord will be my God.” He goes on to say that as he has set up this pillar (מַצֵּבָה), he will give a tenth of all the Lord gives to him. What is interesting about what Jacob is doing is found in the use of the Hebrew word metzevah (מַצֵּבָה). 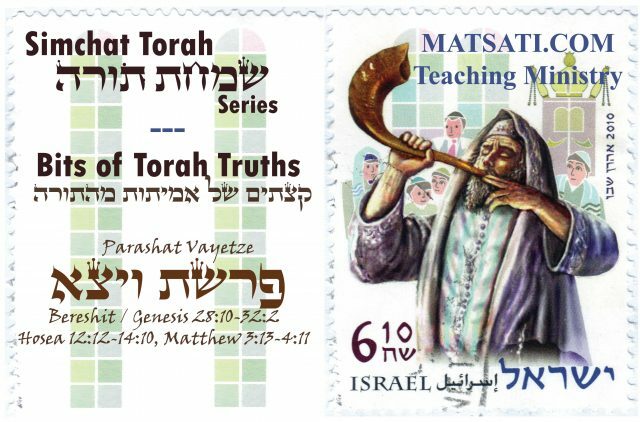 The word metzevah (מַצֵּבָה) is used elsewhere in the Tanach as a reference to setting up an “image,” as in the case of Israel’s sin of setting up an image to worship. In the Tanach we read the following according to Hosea 3:4. Here we are told that a day is coming when Israel will abide without a king, prince, sacrifice, image, ephod, and teraphim. The word Teraphim is explained in the rabbinic literature as a reference to disgraceful things, and in many English translations of the Bible it is translated as idols, or household gods. The Lord is telling Israel through the prophet Hosea that there will come a day when they will not have anything, including their detestable things, their idols and images of worship. Jacob is not necessarily setting up the metzevah (מַצֵּבָה) as an idol image. He is setting the pillar up as a marker or point of reference for return to the place the Lord revealed Himself. In his own way he is making a covenant with the Lord God in heaven, but he does not make the covenant in blood, he does so with stone and with oil. Here Jacob makes a covenant with God asking him to be with him, to make him safe, and to provide him with the necessities of life on his journey in a different land. In the covenant that Jacob makes, his statements appear to be almost a test of whether the Lord will be His God that is based upon whether the Lord will provide him with the necessities of life. In a sense, Jacob is asking the Lord to redeem him, he is being exiled and he looks forward to the day when the Lord will bring him back. The way in which Jacob speaks his covenant with God (“if the Lord God will be with me and give me the necessities of life, then returning to this place having been given the necessities of life the Lord will be my God.”), there appears to be an interesting parallel in the midrash on Tehillim / Psalms 80, Part 2 the rabbis state, מה שנת גאולה פרנסה, אף שנת פרנסה גאולה “As a year of redemption brings with it the necessities of life, so a year that brings the necessities of life brings redemption with it.” The rabbis use an Epanodos in their description of to listen, to give ear. (Epanodos – a figure of speech where earlier words are repeated in the reverse order.) The rabbis make a statement and then reverse the word order for the purpose of emphasizing the play on the meaning of the words and their interaction with one another. The homiletic introduction states that the year of redemption (שנת גאולה) brings the necessities of life (livelihood, פרנסה) and then reverses the order, the year of necessities (שנת פרנסה) brings redemption (גאולה). The question is how does the year of redemption bring the necessity of life, and how does the year of the necessity of life bring redemption? Is this the concept that Jacob had when making the covenant and request for the Lord to provide the necessities of life and to bring him back (redeem) into the Land? We might be able to gain some insights into this reading from the Mishnah Pirkei Avot 6:6-7. Note how consistent these words are with Yeshua’s words in John 12:50. If we consider these words from the Mishnah and the homiletic introduction states that the year of redemption (שנת גאולה) brings the necessities of life (livelihood, פרנסה) and then reverses the order, the year of necessities (שנת פרנסה) brings redemption (גאולה). Asaph’s words calling out to the Lord to give ear, Asaph is seeking the Lord God in heaven to hear; the year of redemption is connected to seeking the Lord and the Lord who provides the necessary redemption for His people, which leads to the necessity of life as is found in the Torah, and its connection to the source, Yeshua God’s Messiah. The year of the necessity of life corresponds to the redemption, by reason that when one obtains these necessities which lead to the redemption of the world, one has God’s redemption. Note how the list appears to be the work God begins in us who are in the Messiah, the creating of the new man, our motivation, the changed heart, the plans for our lives to serve Him, to live for Him, all of these things are connected. From a rabbinic context, the year of redemption brings the necessity of life, and the year of the necessity of life brings redemption, because the Lord God in heaven is involved. 2. Give ear, O Shepherd of Israel (Tehillim / Psalms 80:2). As a year of redemption brings with it the necessities of life, so a year that brings the necessities of life brings redemption with it. And so redemption sustains us every day, so the necessities of life maintain us every day. As a redemption is miraculous, so the necessities of life are miraculous. Rabbi Samuel son of Nahmani taught, The miracle of the necessities of life is greater than the miracle of redemption, for while redemption depends upon an angel, as Jacob said, The angel who has redeemed me form all evil (Bereshit / Genesis 48:16), the necessities of life come from the hand of the Holy One blessed be He, as Jacob said, The God who has been my Shepherd all my life long unto this day (Bereshit / Genesis 48:15). Hence Give ear, O Shepherd of Israel. You that led Joseph like a flock (Tehillim / Psalms 80:2), as Joseph in the seven years of plenty gathered for the seven years of famine, so I will gather in the life of this world for the life in the world to come. As Joseph sustained his brothers according to their deeds, as is said, And Joseph sustained his brethren according to the little ones (Bereshit / Genesis 47:12), do You sustain us according to our deeds. Rabbi Menahema said in the name of rabbi Abin, As Joseph, whose brothers had required him with evil deeds, requited them with good deeds, even so have we, in a manner of speaking, required You with wicked deeds, having transgressed Your commandments, but You have required us with good deeds. Hence You that led the flock like Joseph. ב רועה ישראל האזינה. מה שנת גאולה פרנסה, אף שנת פרנסה גאולה, ומה הגאולה בכל יום, אף פרנסה בכל יום, מה הגאולה פלאים, אף פרנסה פלאים, אמר ר׳ שמואל בר נחמני הפרנסה גדולה יותר מן הגאולה שהגאולה תלויה על ידי מלאך, שנאמה המלאך הגואל אותי (בראשית מח יו), והפרנסה על יד הקב״ה, שנאמר האלהים הרועה אותי (שם שם בראשית מ״ח טו), הוי רועה ישראל האזינה. נוהג כצאן יוסף. מה יוסף כינס בשבע שני השבע לשבע שני הרעב, אף אני אכניס מחיי העולם הזה לחיי העולם הבא, מה יוסף כלכל את אחיו לפי מעשיהם, [שנאמר לחם לפי הטף (בראשית מז יב)], אף אתה כלכל אותנו לפי מעשינו. אמר ר׳ מנחמא בשם ר׳ אבין מה יוסף גמלו אחיו רעות והוא גמל עליהם טובות, אף אנו גמלנוך (לך) רעות ואתה גמלת עלינו טובות כביכול שעברנו על מצותיך, הוי נוהג כצאן יוסף. Notice how Moshe writes concerning the way the Lord fed the people in the wilderness. The purpose was to humble the people and to test them, so that they would not believe it was by their own power they entered into the promised Land. Moshe states that it is the Lord God in heaven who gives us the power to make wealth. It is for this propose, to confirm the covenant He swore to our fathers. The Lord gives us the ability to obtain the necessities of life, and He wants us to recognize that it is the Lord who is doing this. The point is, we are to recognize who it is that gives us life so that we do not turn to other gods to serve them or to turn to our own ways away from God’s ways. Another interpretation may be that the necessities of life may become a god or an idol in one’s heart by the pursuit of wealth and gain to the point of neglecting our service to the Lord, and our service towards others. In addition, the same could be said of pride, which is the raising up of ourselves, thinking more of ourselves in our hearts than what we truly are. Jacob had the perspective that all he will receive is from the Lord and that what he has he will give back. The rabbis conclude the necessities of life is a greater miracle than the miracle of redemption. The reason being, “redemption” depends upon a messenger (מלאך, angel), as opposed to “necessity” that requires God’s hand upon one’s life to sustain and to bless as we learn according to Parshiot Toldot and Vayetze, in the lives of Jacob and Joseph, respectively. The concepts of redemption and the necessities of life are paralleled to Joseph’s life in Midrash Tehillim 80, Part 2, and his God given gifts and putting him in a place of power to preserve the people. This is described as God “Gathering in, the life of this world, for the life in the world to come.” This illustrates God’s role in the work He is performing in our lives to bring us into the world to come. This is then paralleled in God’s working in our lives for the purpose of sustaining us in our deeds. The basic concepts here in relation to Parashat Ekev (Devarim / Deuteronomy 8:18), the Midrash, the Mishnah, and the Torah portion is the idea of the Lord God who causes us to do good works. The question presented here for us is in the context of works which merit the kingdom of God. Do your works merit the kingdom of God? Or said another way, do you see the Lord God working in your life to produce good works? Is the Spirit of God working in your life to cause you to live a humble life, to do good works, to do justice, and righteousness, to live holy lives, and to help the poor and your neighbor? If not, why not? Jacob expected the Lord to work in this way in his life. Do you expect the Lord to work in this way in yours? Midrash Tehillim 80, Part 2 concludes saying, “Rabbi Menahema said in the name of rabbi Abin, As Joseph, whose brothers had required him with evil deeds, requited them with good deeds, even so have we, in a manner of speaking, required You with wicked deeds, having transgressed Your commandments, but You have required us with good deeds. Hence You that led the flock like Joseph.” The conclusion of the midrash is that in the evil deeds we have done, the Lord God continues to bless us doing good things for us. The midrash states that God required use with good deeds. The word used here is גמלת meaning “benefited.” Though we have transgressed the Torah command, the Lord benefits us with goodness and righteousness, and calls us back to His ways and to faith in his Messiah, the redeemer. The topic of this week’s Torah potion is the Manner in which God’s Word affects a Faithful Heart. The point is to consider in your life how God’s word affects you; do you have a faithful heart? Jacob believed in the word and the promises of God. While studying the Apostolic Writings (NT) it is amazing how often the authors cite examples from the Torah and the Prophets as launching points to introduce what they are about to teach. This denotes the significance of the Torah and the Prophets for us today and the need to be diligent students of God’s Word and of our own lives. The author of the book of Hebrews has much to say about the Torah and the Messiah. The most difficult aspect is how to understand or interpret the meaning of Scripture. Depending on one’s background, there may be a number of ways to interpret a simple passage to have various meanings. This delineates the issue of interpretation having the aspect of being very emotionally driven. Emotions have a huge effect on our understanding of God’s word, specifically in tradition which is considered very emotionally motivated. The question is do you follow tradition because it makes you feel good, are you more emotionally motivated to follow tradition as opposed to Scripture? Hebrews 4:7-12 explains the effect of God’s word, which is stronger than any two edged sword and is capable of causing a division between both the soul and the spirit and dividing between joints and marrow, and judging between the thoughts and the intentions of the heart.